Tracking a volcanic plume reaches new heights, faster. On April 14, 2010, day turned to night when Eyjafjallajökull in Iceland erupted, billowing volcanic ash and sulfur dioxide into the atmosphere. Eight hundred people were evacuated, while hundreds more were confined inside because of the noxious ash fall, which already poisoned nearby farm animals. 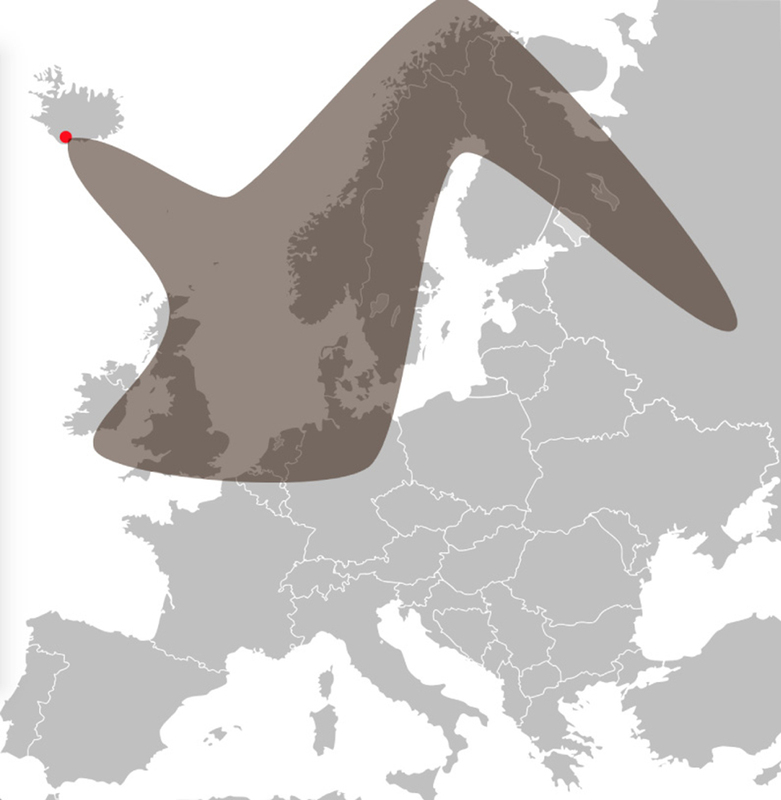 The plume then drifted across Europe, creating the largest air travel disruption since World War II. Over 100,000 travelers were grounded in eight days. “It was a big headache for the aviation industry, costing billions in canceled flights,” said John Yorks, a research scientist at NASA's Goddard Space Flight Center. Neither a pilot nor weather radar can distinguish a volcanic plume from a regular cloud, with potentially catastrophic results. Ash clouds—or tiny, jagged fragments of pulverized rock and glass—instantly melt within a plane’s multiple 1,000-degree Celsius (1,832-degree Fahrenheit) jet engines, coating turbine blades with glass and shutting engines down. Since the 1990s, experts from nine Volcanic Ash Advisory Centers have advised the aviation industry, using a mosaic of data, including satellite data, to map the plumes. Too often, the most comprehensive satellite data have lagged. Launched in 2015 and operational for 33 months, a small NASA instrument on the International Space Station (ISS) delivered an unexpected bonus—it cut the waiting period for this detailed data. The Cloud-Aerosol Transport System (CATS) project was cheaper than the big missions, but its small sensor accomplished something mighty, and Yorks understood its potential impact. When John Yorks was a little boy, he lay in the yard of his suburban Philly home watching the clouds. Some puffs swirled, other streaks scurried, while still others seemed to stand still. Yorks wondered how is this possible? Why do they move at different speeds? Are they at different heights? He studied these questions through to his PhD, and then arrived at NASA to work on the CATS project. Little did he know that his boyhood wonders would unravel complex problems—like accurately tracking a volcanic plume. CATS uses Light Detection and Ranging (Lidar), a remote sensing method that measures ranges or variable distance to Earth with a pulsed laser. The pulse’s intensity can describe cloud composition, aerosol type and abundance, even the altitudes of these layers. Prior to satellite lidars, NASA relied on passive sensors, which processed radiation reflected and emitted by Earth’s atmosphere. This method could detect aerosol and cloud concentrations but was unable to distinguish heights. For continuous, near-global coverage NASA turned to space. CATS was only the second lidar instrument to make it there. 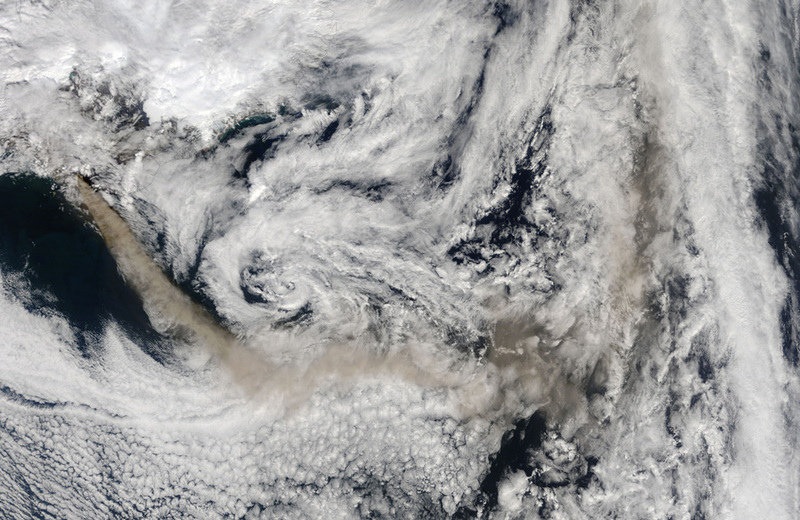 The first was the NASA Cloud-Aerosol Lidar and Infrared Pathfinder Satellite Observations (CALIPSO) satellite, which began tracking smoke from fires, dust storms, and volcanic eruptions in 2006. CALIPSO’s primary mission lasted three years, and since has relied on its backup laser. The next satellite mission with a lidar onboard is scheduled to launch in 2018. Scientists saw CATS as a potential bridge between these two space missions. Yorks helped a team of engineers at NASA Goddard build CATS with CALIPSO data users in mind. They wanted the data to feel familiar. Unfortunately, CALIPSO data downloading capabilities were slow. It was primarily used for validation, and correcting calculations if the plume was long-lasting, like the 2011 eruption from Puyehue-Cordón Caulle in Chile, which circled the globe three times. With CATS being on the ISS, Yorks realized data could be downloaded quickly, meaning airlines and communities could be warned within hours of a plume’s path. What he needed now was a demonstration. On December 3, 2015, Sicily’s Mount Etna spewed a cloud of volcanic ash and sulfate aerosols into the atmosphere. Though not a big eruption, Etna was good forecasting practice. While Yorks processed the data from CATS, a few scientists down the hall began forecasting the plume’s path. They initially did so without any lidar information. Eric Hughes, a graduate student at the University of Maryland, assisted. He said, “Modeling plumes is a really cool transport problem.” A plume disperses in air like ink in water. How it moves is a matter of internal, quantity and force, and external components, such as temperatures and winds. In Mount Etna’s case the ash fell out within the first day of eruption, separating from sulfur dioxide (SO2). SO2 oxidizes to sulfate aerosols, which can remain as long as three or four years in the atmosphere, cooling the globe by scattering solar radiation. Dust-like, volcanic ash can also be difficult to quantify, whereas SO2 has a straightforward visible signature within the light spectrum. The team, therefore, focused on SO2. 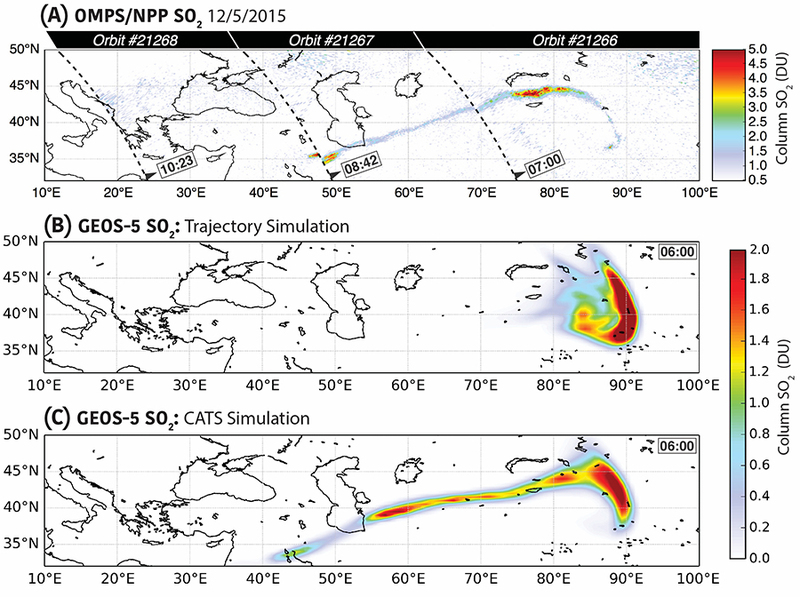 Roughly nine hours after the eruption, an ultraviolent spectrometer produced vertical density maps of SO2 from the Ozone Mapping and Profiler Suite Nadir Mapper (OMPS‐NM) on board the NASA‐NOAA Suomi National Polar-orbiting Partnership (Soumi‐NPP). Using model winds on a super computer, the scientists locked onto SO2 particles within the plume, and traced them back in time to the eruption. From many possible backward paths, they chose the one that arrived closest to Mount Etna, and used its lock-in altitude to see into the future. Its estimated altitude was 7 to 12 kilometers (4 to 8 miles) high within the atmosphere. “Most of the time, we can get the forecast fairly right, but in this case we really got it pretty wrong,” Hughes said. Something went wrong with the model, but Hughes was not sure what. Then Yorks appeared with the CATS data. And because the CATS data were processed similarly to CALIPSO data, Hughes could jump right in. He wanted to know what happened. According to CATS, the plume height should have been at 11.5 to 13.5 kilometers (7.1 to 8.4 miles). Though not a huge difference, it greatly affected the plume trajectory. “If you don’t know that altitude, it’s really hard to model,” Hughes said. Volcanoes can erupt as high as 45 kilometers (28 miles), penetrating the stratosphere. Rain clears ash and aerosols in the troposphere, but in the stratosphere it disperses slower. The original trajectory had the entire plume in the jet stream, where fast winds blow into Asia. Instead, the Mount Etna eruption cloud lingered. Hughes said, “When you get the altitude wrong, you’re placed in the wrong part of the atmosphere, and because winds vary with altitude, if you get that wrong, the winds push you in the wrong direction.” The CATS altitude placed part of the plume in the jet stream and part above, traveling more gradually eastward. The team would have been able to correct their trajectory using CALIPSO data, but CATS data could be downloaded within minutes and then processed within a three- to six-hour latency. Hughes realized that CATS data could be used to forecast in near real-time. This would be a first. CALIPSO can take three days to process data. Partially, because CALIPSO’s orbit is set up to remap the same point once every 16 days, meaning it has a more comprehensive view of Earth, and, unlike CATS, it maps the polar regions. Though CATS has a narrower view of Earth, it overlaps the areas with more volcanic activity more frequently. 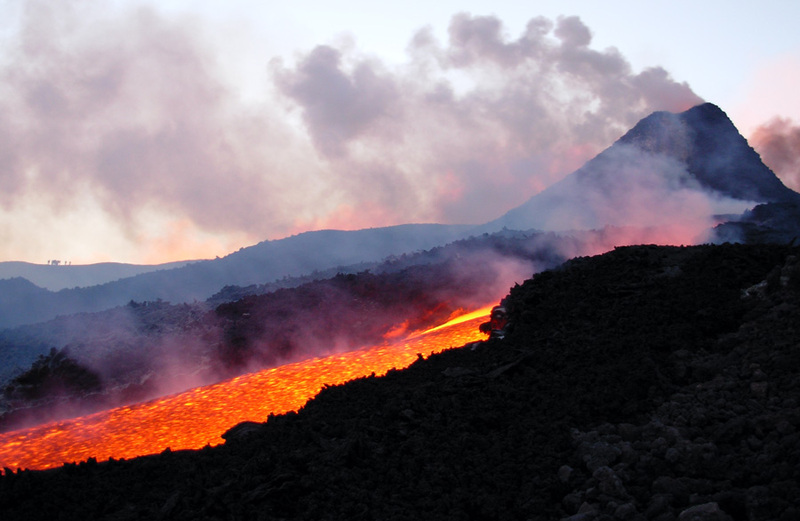 In the future, Hughes hopes for more hands-off plume forecasting for volcanic eruptions. “A lot of this analysis is done by hand,” he said. “We need to move toward plume modeling where CATS is assimilated into the model, and the model corrects the forecasts based on the CATS observations.” With CATS near real-time accessibility, this could become a reality. CATS increased frequency can be more than a bonus to the aviation industry. CATS provides vertical profile measurements, slices of the atmosphere, that help monitor air quality. “Besides plume monitoring, there is a lot of work being done near the surface. So when you have dust storms or wildfires, we’re using lidar data to improve forecasting those events and how those impact human health,” Yorks said. Abrasive aerosols near the Earth’s surface cause deadly respiratory illness, killing 68,000 people in the United States and 3.3 million people globally. CATS ceased operations in October 2017, outlasting its six-month requirement by a little more than two years. Now that CALIPSO is relying on its backup lidar, fingers are crossed that it will last until the joint European and Japanese spacecraft, EarthCARE, or Earth Clouds, Aerosols, and Radiation Explorer, becomes operational at some point in 2018. The next NASA mission with a lidar aboard is planned for post 2020. A gap in data and loss of long-scale observation may interrupt computer modeling, critical to understanding the climatological impacts of clouds and aerosols. Yorks and his team have put together a proposal for a second CATS instrument to fly on the ISS, hoping that this time CATS-2 might catch a massive eruption, so modelers like Hughes and his team could use the data in near-real time to track the next big one—something everyone has been preparing for. Hughes, E. J., J. Yorks, N. A. Krotkov, A. M. da Silva, and M. McGill. 2016. Using CATS near‐real‐time lidar observations to monitor and constrain volcanic sulfur dioxide (SO2) forecasts. Geophysical Research Letters 43, doi:10.1002/2016GL070119. McGill, M. 2016. CATS-ISS_L2O_D-M7.1-V1-05kmPro. NASA Atmospheric Science Data Center (ASDC), Hampton, VA, USA. doi:10.5067/iss/cats/l2o_d-m7.1-v1-05_05kmpro. Yorks, J. E., M. J. McGill, S. P. Palm, et al. 2016. An overview of the CATS level 1 processing algorithms and data products. Geophysical Research Letters 43, doi:10.1002/2016gl068006.